In April 2015 over 1400 people joined me for a 30 day “Creative Basics” challenge that took them from start to finish to create everything from text-only graphics to quote graphics and quite a few things in between. Now you can take the challenge at your own pace with all the great content (plus some extra resources!) with the 2017 Creative Basics: 30 Days to Awesome Social Media Art book! …and, by the end of it, you’ll even create a free printable to offer your readers! This is content that I typically share at conferences collected from over 10 years of marketing, blogging and social media experience, all in one all-encompassing resource for you to work through at your own pace! Each day you’ll find one challenge to tackle. Every challenge will build upon the one before so that, by the end, you’ll have all the tools you need to create our final project – a free printable! When you purchase the course you’ll also receive bonus material, videos, and special discounts you won’t find anywhere else! From April 1-30 on Instagram you’ll find a daily challenge straight out of the Creative Basics book, encouragement, Instagram story Q&A each Friday, and more. I can’t say enough about how helpful and fun this course was! I’ve been blogging since 2007 and have learned bits & pieces along the way to liven up my photos but this course definitely took me to the next level. The daily assignments were bite-sized and not overwhelming but also built on each other so you were able to build and reinforce your skills along the way. The final thing I didn’t add? I just had my 69th birthday during the month we took this course. It proves you CAN teach an old dog new tricks! Like many people with a small business I relied on larger companies for my media. The problem with that is all of it has someone else’s watermark embedded in it. All I was really doing by using it was sending more business to them. With Crystal’s course, Creative Basics, I have learned to make my own amazing media. I can tailor it to my clients and to the media format I need. This course has taught me to change the formatting of my images to fit my Blog, Instagram, Pinterest, Facebook, & even Twitter. With the first post I made myself for Facebook my reach increased three fold. People are sharing my creations! This in turn is bringing more traffic to my blog and increasing my client numbers. The Creative Basics course is the best investment I’ve made this year and I had fun doing it. In today’s visual world, graphics and photos or a combination of the two, are more important than ever. Images are a critical element of any blog or website. You’re going to have trouble hooking and keeping subscribers or fans without a store of visuals. So you owe it to yourself to learn Creative Basics from Crystal Stine. Crystal made it so easy for me, a very non-visual person, to make eye-catching graphics, which garnered comments. I’m more confident creating graphics than I ever imagined I would be. I gained several new followers on Instagram and Twitter. I brainstormed several new ways for presenting my food blog posts in a more visually-friendly way. I’ve been inspired to provide graphics to my readers on a daily basis. I can’t say enough good things about Crystal and her course. As an older gal, I confess techy stuff intimidates me. When I heard about Crystal’s Creative Basics course, I got totally excited. I have been following the lessons all month and have made some really lovely things for my blog, Facebook and Pinterest page. Crystal’s instruction was so clear and encouraging that I had fun, gained confidence and learned some great stuff! Highly recommend her work to everyone! Creative Basics gave me the tools to find my creative side again. It introduced me to new apps for creating graphics and it helped me use the ones I already knew of in better ways. Crystal keeps it simple and attainable, but also gives the confidence to take what you’ve learned from the course and discover more in each app. Now instead of seeing quote graphics and wishing I could create something similar, I know that I can create something better! A wonderful resource! I’ve always seen what other bloggers post, and wondered how to make graphics like theirs – and now I know! It’s easier (and more fun) than I anticipated. This has definitely connected my blog with my social media – I love having a unique eye-catching picture or quote to put on Instagram or Facebook that goes along with a post I’ve written. 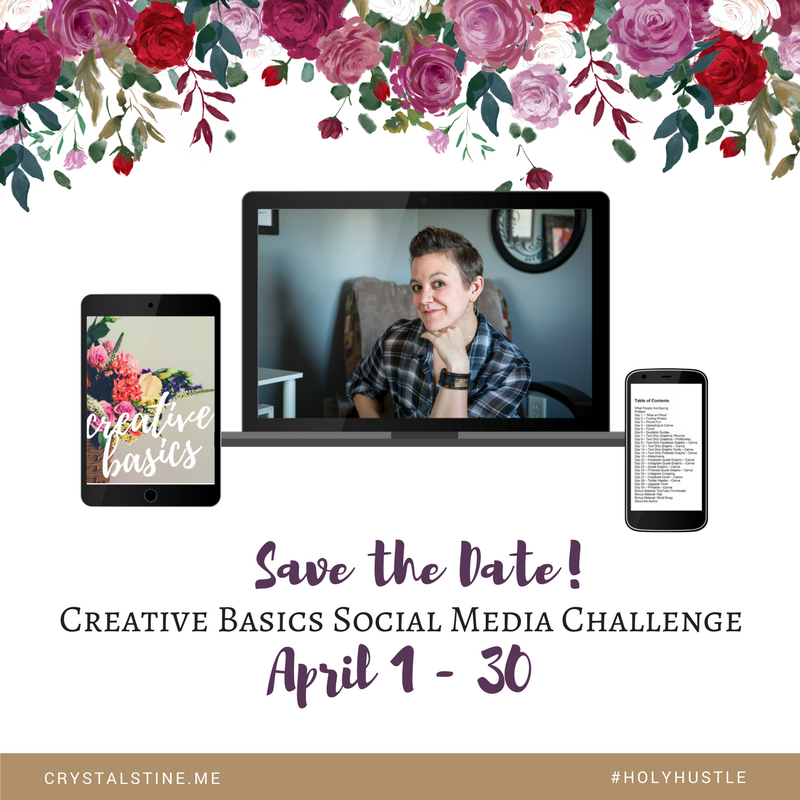 Crystal has put together a very doable course to help us learn more about making creative images to share on our social media channels and blogs. I loved learning about the other web sites and apps she shares, and how each step builds upon each other. Highly recommend it! Crystal keeps things fun and easy to understand. What a gift Creative Basics is, whether you’re a beginner or more experienced with design. I feel more confident, knowledgeable and excited about creating shareable images now that I’ve taken this course! I’ll be honest. I had played around with the various sites Crystal covers, but I had no idea of the depth of tweaking that could be done. Her directions were clear and she walked through each of the tools available to create awesome graphics. Now I feel more confident in what I create for my personal blog and for my husband’s business! I was excited to be a part of this course because I love designing things. I have design experience in several different realms, so I was definitely not a beginner, but I really enjoyed learning about new apps and websites and all the functionality they offer. Crystal did an excellent job of making the challenges basic enough for beginners (with explanations), and yet interesting enough that I enjoyed the daily challenge as well. It was a great course! I am so thankful for Crystal’s Creative Basics course. I love to write but have always struggled with creating graphics on my blog and through social media. Each day, Crystal gave us great, detailed instructions to help us become familiar with apps, websites, and the tools we needed to make creative graphics. The daily assignments were easy to understand, do-able within my margin of time, and so fun! The best part is how Crystal encourages us, answers our questions, and helps us along the way! I highly recommend the Creative Basics course to help you take your graphics to the next level. The Creative Basics course was amazing. Creating my own graphics has been something that has been so overwhelming and frustrating for me in the past. I have tried to use some websites and been frustrated. Crystal was able to teach simple basics of graphic design that slowly built on each other each day. This class has given me the confidence that I lacked before it. The organization of the course was doable for someone who doesn’t have big pockets of time to learn. Each day was simple yet informative and left me feeling very successful. I would highly recommend it! Creative Basics rocks! In bite-sized pieces, Crystal teaches such important information for bloggers and social media users. Learning how to create wonderful images for your blog will make good writing even more appealing to readers. In this course, Crystal offers clear instructions on how to use varied platforms such as PicMonkey and Canva to make images that pop! I learned so much in this course that I will use every time I create a blog post, Facebook post, or Pinterest pin. The Creative Basics course is time exceedingly well spent for any blogger. I was inspired attending a session at Declare Conference where Crystal taught a similar class. So much information packed into a small lab session. When her Creative Basics course was announced I jumped on quickly. I love how Crystal teaches in daily bite-size portions that are very easy to follow and understand. I do know Photoshop Elements, but it is so much easier and faster to utilize the multiple apps and websites that Crystal teaches in this class. By putting into practice what I have learned, I am much more confident about my social media posts by including an image that is more appealing to my audience. I highly recommend this course / e-book! 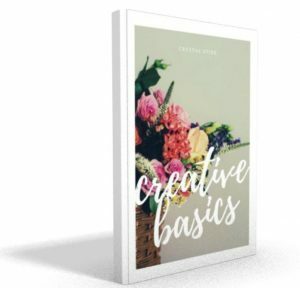 I absolutely love Crystal for this Creative Basics course. I have learned so much in such a short amount of time. I have used PicMonkey quite a bit, but I learned about so many other FREE tools available on the web and I even learned things about PicMonkey I didn’t know before. The tips were great. The practice didn’t require too much time from my day, but the knowledge gained was IMMENSE! I will definitely recommend it to anyone looking for a little help in image expertise. Crystal does a wonderful job of presenting usable websites with oodles of tools and resources. She makes each step in the course achievable in short bursts of time which keeps it simple and straightforward. Without being overwhelmed, I was quickly creating great images I was proud to showcase on my social media.